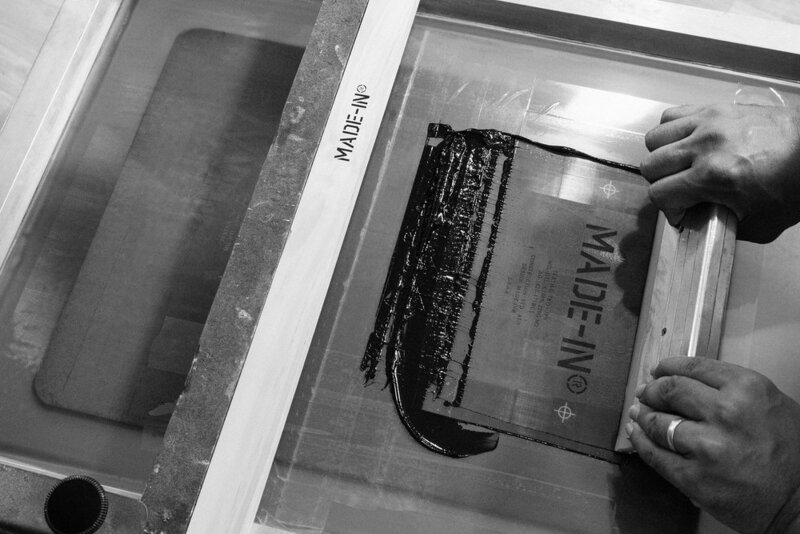 A behind the scenes look into the process of hand screen printing. An artwork has been overlaid onto a silk screen and exposed by an ultraviolet light in order to burn a stencil through the mesh. Before printing commences the screens are examined and touched up to repair any minor imperfections. Screen printing inks are mixed according to the design specifications using Pantones as a guide and a creative eye to match them just right. Using downward force and a sliding motion the freshly mixed ink is pressed into the garment through the stencil using a squeegee. Once the print has been completed the garment must go through a curing process. The garments are fed through an oven with intense heat on a conveyer belt. When cured the ink is dry and permanently set into the fabric.